Miya Yoshitani of APEN speaks at a press conference for the Sept. 8 climate march. When President Trump pulled the U.S. out of the Paris climate agreement, California Governor Jerry Brown announced that he would host his own "Global Climate Action Summit." So on Sept. 12-14, hundreds of business and government leaders from around the world, along with experts, nonprofits, and national officials, will convene in San Francisco. Their purpose is to discuss ways of stepping up their efforts to meet the goal of the Paris agreement — keeping global temperature increases below 2 degrees Celsius, or 3.6 degrees Fahrenheit, in order to prevent the worst effects of climate change. In conjunction with Brown's summit, thousands of activists will hold their own events, kicking off with a massive march on Sept. 8 and including three conferences, several protests (some including civil disobedience), a film festival, and programs to showcase the voices of the "frontline communities" most impacted by the fossil fuel industry. At the official Global Climate Action Summit, businesses and state and local governments will be asked to make specific commitments to meet six challenges: increasing the use of clean energy, setting "science-based" targets for reducing greenhouse gases, promoting "land and ocean stewardship," shifting private investment toward climate solutions, and developing new technology to address the crisis. Many activists see the alternative events as pressure for stronger summit results. 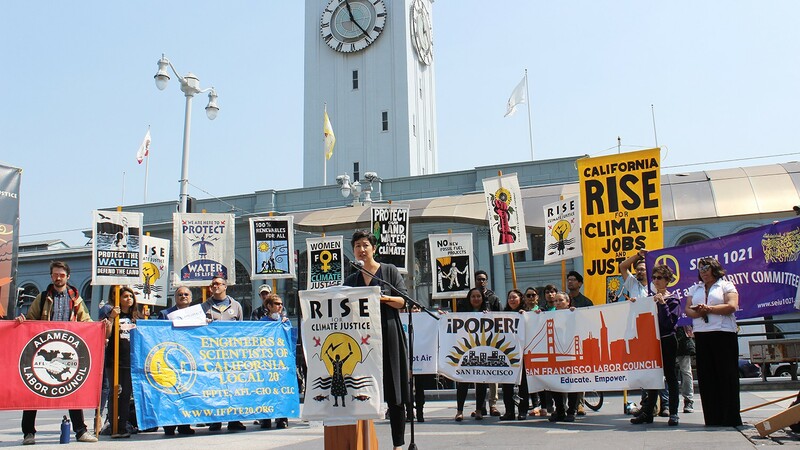 "We need to hold them accountable, put their feet to the fire, transition to supporting investments in local solutions that have been working," said Alvina Wong of the Oakland-based Asian Pacific Environmental Network (APEN). Some directly challenge Brown's claim to be a climate leader. A statewide coalition called Brown's Last Chance argues, "California's current climate path is insufficient to meet even our short-term goals." They say that while Brown has promoted the use of clean energy, he has done nothing to restrict California's oil and gas production. A new report by the nonprofit Oil Change International found that during Brown's administration California has issued more than 20,000 permits to oil companies to dig new wells. "We're in a huge climate hole. The first step is to stop digging," said David Turnbull of Oil Change International. "If we're not keeping fossil fuel in the ground, we're not going to solve the climate crisis." The Brown's Last Chance campaign is demanding that Brown — and the next governor — stop issuing permits for new fossil fuel projects. They also advocate a "planned phase-out" of oil and gas production with a "just transition for workers, communities, and economies" affected by the fossil fuel industry. Despite a recent state report celebrating California's early achievement of 2020 greenhouse gas reduction goals, many oil-industry experts say Brown's showcase "cap and trade" program is not the reason. Factors like the heavy rainfall in 2016, which lead to an increase in hydroelectric power, were more significant. And a new study shows that under cap and trade, local pollution has actually increased in the frontline communities near a majority of the regulated facilities. Many of those frontline communities will be leading the events in San Francisco, organized under the banner "Solidarity to Solutions" (Sol2Sol), a national coalition of grassroots groups based in "frontline communities impacted by the systemic interaction of poverty, racism, and pollution," said Miya Yoshitani of APEN. This coalition emphasizes the importance of "having climate solutions center on the communities most impacted by the fossil fuel industry," she added. "The issues connect," said Isabella Zizi of the indigenous environmental organization Idle No More. For example, "climate change affects food systems and water supply. Indigenous people from the global south are low on water, so they migrate north, then face deportation." Climate change also contributes to the housing crisis, said Martha Hawthorne of Service Employees International Union Local 1021. "We have affluent people moving into places like San Francisco, where it's still pretty comfortable. Where my mother lives — near all the fires — it's a low temperature when it's 90 degrees. And many people in the North Bay lost their homes in the fires." That housing crisis, in turn, adds to climate change, said Antonio Diaz, of the mostly Latino community organization PODER (People Organizing to Defend Environmental and Economic Rights). When soaring prices push people out of San Francisco, he said, "they have to travel longer distances to work and school." More driving means more greenhouse gas emissions. Annie Dobbs-Kramer of the North Bay Organizing Project pointed to another connection: While industrial agriculture worsens climate change, its use of pesticides also harms the health of many farmworkers in Sonoma County and elsewhere. "We need an integration of approaches to address both climate change and the inequality endemic to our communities," said Yoshitani. "If we don't do that, we won't get to the roots of the climate crisis." It's the communities most affected that are developing the most powerful solutions, she added. Yoshitani said we need massive public and private investment to bring community solutions to scale. For example, "Rather than giant renewable-energy farms in the desert, we need small-scale renewable energy everywhere," she said. The new East Bay Community Energy program, she said, shows the direction we need to be going in. That local approach, she added, can be used with other systems, such as food and transportation. Local production of food and other necessities, for example, could mean less diesel trucking, a major source of both greenhouse gas and toxic pollution, said Wong. Sol2Sol events will showcase solutions being developed by frontline communities in the Bay Area and across the country. Participants will include Kentuckians for Commonwealth, which is working on a transition from coal mining to renewable energy, the Black Mesa Water Coalition, which is working to develop solar energy on Navajo land, and many more.